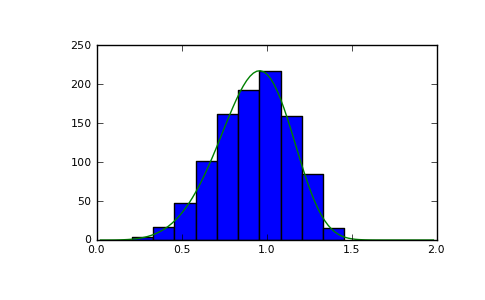 Draw samples from a 1-parameter Weibull distribution with the given shape parameter a. Here, U is drawn from the uniform distribution over (0,1]. The more common 2-parameter Weibull, including a scale parameter is just . The Weibull (or Type III asymptotic extreme value distribution for smallest values, SEV Type III, or Rosin-Rammler distribution) is one of a class of Generalized Extreme Value (GEV) distributions used in modeling extreme value problems. This class includes the Gumbel and Frechet distributions. where is the shape and the scale. The function has its peak (the mode) at . When a = 1, the Weibull distribution reduces to the exponential distribution. [R214] Waloddi Weibull, Professor, Royal Technical University, Stockholm, 1939 “A Statistical Theory Of The Strength Of Materials”, Ingeniorsvetenskapsakademiens Handlingar Nr 151, 1939, Generalstabens Litografiska Anstalts Forlag, Stockholm. [R215] Waloddi Weibull, 1951 “A Statistical Distribution Function of Wide Applicability”, Journal Of Applied Mechanics ASME Paper.